Throughout history the minds of men have been shaped through those with gifts of communication and debate. Greek men stood on soap boxes in Corinth and spoke philosophy during the 1st Century. During the Reformation, men’s values were put on trial before audiences to discuss and debate. The power of communication has the power to influence each generation. Today we’ll discuss the power of podcasts. When I was growing up, I was one of these men who struggled to find my voice with like-minded men my own age. As a young Christian man, growing up in a small town, if I ever shared my opinions, people would laugh or cringe. I found no group of people for me. When I joined the Royal Australian Navy, and a little later on, seminary, I found like-minded people to wrestle these deeper convictions with. Another area I’ve always found solace in is listening to podcasts. A while back I wrote an article titled Why an Ultimate Playlist is Good for a Man’s Soul. Music is good because it can provide help when words fail. A podcast adds to this and can put people’s unspoken thoughts into words. It also gives a podium for men who might feel voiceless to talk these beliefs in a like-minded community. For the past 18 years the podcasts have gained significant momentum. Many people attend conferences and forums to discuss the latest shows hitting media platforms. These shows fill the void and silence for the young man while he is on his morning jog, having his session in the gym, and those long road trips. So it is no wonder that the podcast is becoming such an integral part of the modern gentleman’s life. A few podcasts have captured my attention. 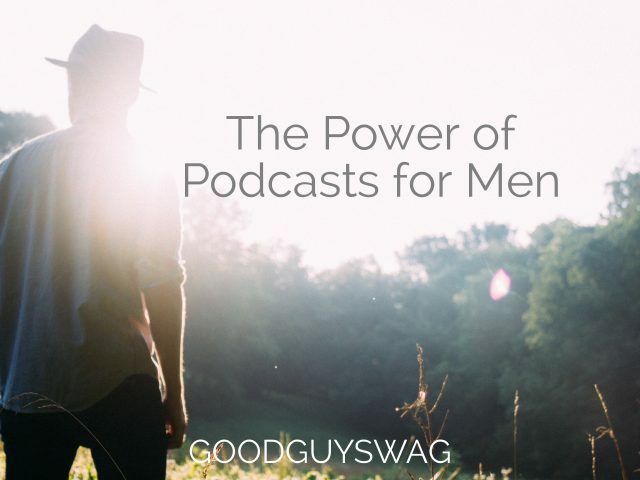 They range from story based shows like “Serial and Criminal,” to the Christian speakers found on the Gospel Coalition and motivational talks for men elsewhere. While they may be unknown to many of you, here are a few podcasts that deserve a mention, and I encourage you all to give them a follow. They cover three areas of culture in the faith-based life: Music, Films, and Culture. This Indie Christian music podcast The Eclectic was established in January 2017. Joel and Chris both unpack and uncover original Christian music from a diverse range of genres. These boys hail all the way from Perth, Australia. Their unique take on Christian music offers a refreshing laid back feel. They feature background stories to current bands across many genres, the processes for song writers, lyric dissection, and interviews with music artists. The brilliant thing about this podcast is that these boys manage to lay everything bare and get to the stories behind artistic choices within the music industry. The Popcorn Theology podcast is a weekly US based show that deals with different subject matters that arise in popular films and entertainment, by looking at them through the lens of a Biblical worldview. Each week the hosts Richard, David, and James objectively discuss a film or genre that impacts culture, and how some themes can point the audience to faith in God. It has become a place where film and theology meet. What I enjoy about this podcast is the fact that they can agree and disagree on many factors, but their desire to cut away from surface level talk and find those deeper sub contexts unites the conversations. As a film and entertainment addict, this podcast has drawn me in as they encourage further discussion, debate and thought. I would like to finish with Push the Narrative. Ross, Justin, and Gabe from Colorado are fairly new in the podcast world as presenters, but they are quickly gaining a strong following since they rebranded their weekly discussion. Each week they open up a discussion on a theme that affects the Christian life and culture. I will finish with this thought: While previous generations may have enjoyed radio stations pumping out the latest tracks, a new generation is grabbing hold of the humble podcast and enjoying the benefits that it offers the mind. Maybe it is that time that you grab hold of one of these podcasts and enjoy the fruits that they bring to your life. You keep it up now, unsnrdtaed? Really good to know.